I’m always on the lookout for good tailoring tools, especially in antique shops. You can find some quality items if you’re lucky. 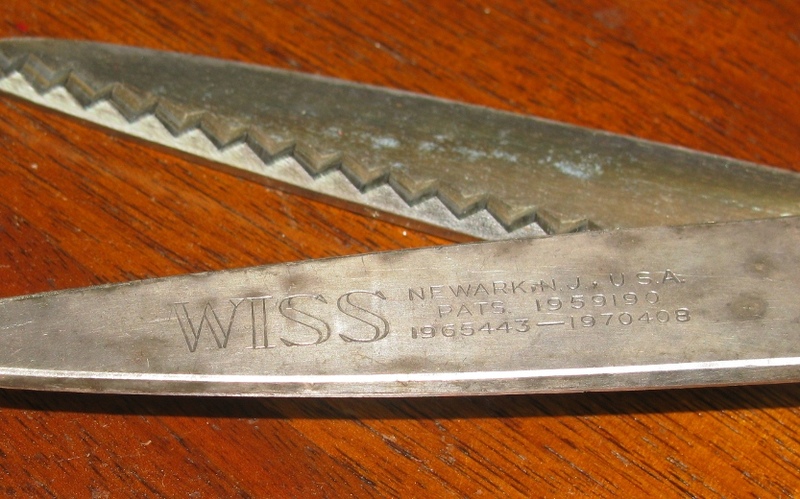 While vacationing in Lake George, New York this past month, I was fortunate to come across a pair of Wiss Pinking Shears in an antique store, for only $15. 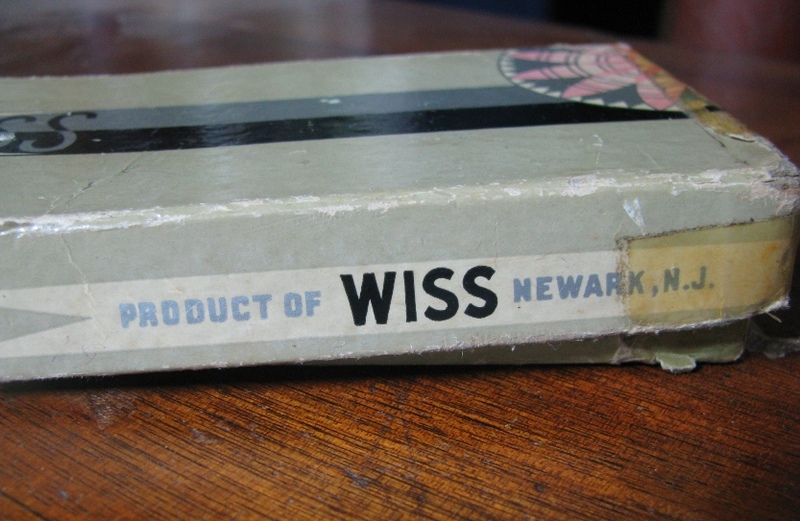 A close-up shot of the box reveals they were made in Elizabeth, New Jersey. Who knows where they are made today. I feel that things were made to a much higher standard of quality back then, whereas today so many things are made in China. And finally, opening the box reveals the shears themselves. As you can see, they are in fairly good condition, the worst thing being a bit of tarnish. Finding the original instruction sheet as well was a nice surprise. Here they are out of the box. This model measures 10 1/2 inches in length, which I believe is the largest size they make. A close-up shot of the blades allows you to read the inscription. I had been hoping for some kind of serial number to see when they were made, but they turned out to be patent numbers. For those of you who weren’t aware, pinking shears are different than normal shears in that the blades are saw-toothed instead of straight, leaving a zigzag edge instead of a straight edge. This helps prevent fraying to some degree by limiting the length of the frayed thread after it’s cut. This would have been very handy to have last month as I was tailoring my silk waistcoat. When I first tried the shears, I was disappointed to find that they were incredibly dull. However, a quick search online revealed that they were relatively easy to sharpen yourself, unlike tailors shears. I found this very informative and edifying video on Youtube on the proper sharpening technique for pinking shears. After proper sharpening, and a good oiling with standard sewing machine oil, they cut like new again! These pinking shears are but one of the many tools a tailor uses on a day to day basis. I’ll go over more of them when I come across interesting or unusual finds. Please comment and share with your friends! I’d date these to that time period as well. I’m afraid I’m not too familiar with period pinking machines. It seems they would have had different style blades for different affects? Scallops, zig-zags, etc? When I helped a friend with her chemise, the pattern called for scalloping along one of the edges. I recently had the unfortunate task of packing up my mom’s things when she past away. 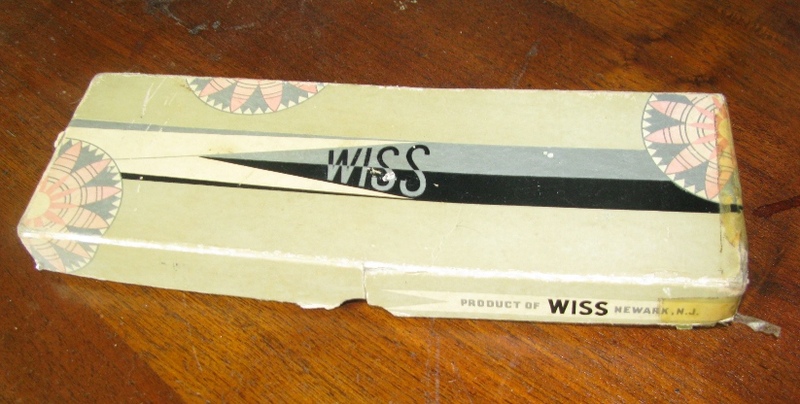 I came across Wiss Pinking Shears, also in their original box. These have black handles and there’s an indentation inside the box where the screw on the scissors sets in to secure them in the box or perhaps to protect the screw. Thanks for the how to sharpen pinking shears. I have a good quality pair from Sheffield England that need sharpening and can’t find anyone here who can do it. Thanks for the info on the shears and sharpening. I have my grandmother’s pair -same numbers as your photo- she did men’s tailoring in the 1940’s and 1950’s – and these are Heavy. Just wish there were sharp enough to use again. 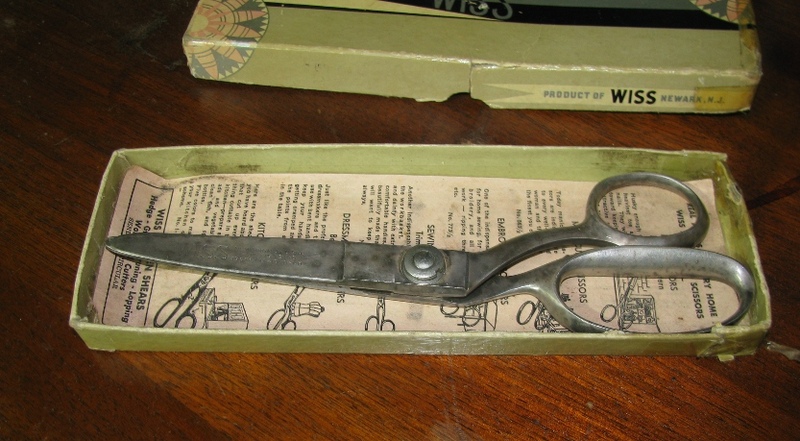 I have a pair of Griffon Pinking Shears, apparently the blades are removable and were replaced, still have the shears and box, wondering if replacement blades might be available, a sharpening shop in NYC did not think they could be sharpened. They’re definitely able to be sharpened. I’m going to try to post instructions on that soon, possibly a video. I got an old pinking shear for my wife made by Sweiss it has a number 29 on it.I can’t find out much about the manufacturer.The shear is aluminium with detachable blades.I looked up the first patents and it is almost the same as the first patented one.If anyone has any info on this pinking shear I would appreciate hearing about it.Thanks Ian Palmer in New Zealand. Jan/2018: Have scissors like yours; same pat. #following the 1970408–2286874. Would like any addl. info. Need to know what tool to use to tighten scissors. Will try to sharpen also. Inherited from deceased family member.No paper/no box. So glad I found your info today. Thanks!! I have a pair of Wiss pinking shears I found at a thrift store. They are very tight/stiff though. Any information on your instruction sheet about how to loosen them? or is it just oil they might need? Thank you! Yes, a drop or two of sewing machine oil should loosen them!